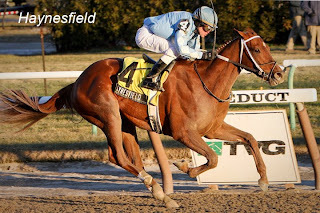 (The Handicapper's Edge) Saturday's $68,460 Count Fleet S. was expected to be the coming-out party for Turtle Bird Stable's HAYNESFIELD (Speightstown), who was hammered down to 1-2 favoritism in his first start outside of New York-bred company. Although it was not as stylish as his 5 1/4-length victory in the Damon Runyon S. last time out, the Steve Asmussen colt duly prevailed after a brief tussle in the Aqueduct stretch, and stamped himself as a major player on the New York road to the Kentucky Derby (G1). Haynesfield showed signs of inexperience and attempted to lug in, but Ramon Dominguez kept him straight, and he gradually drew off by 3 1/2 lengths. The chestnut stopped the teletimer in 1:44 3/5 for one mile and 70 yards on the fast inner track, rewarding his backers with mutuels of $3, $2.50 and $2.10. "Obviously, it was a very different trip than last time," Dominguez said. "I didn't want to push him. He relaxed nicely. It was just a matter of getting in the clear. He tried to lug in -- he did the same thing last time. I was aware that we were following quick fractions. When it was time to pick it up, he did." "The race was very nice; I mean, he won," assistant trainer Toby Sheets said. "It wasn't visually as impressive as last time and the competition was a little bit different, but he won".